Château Feely is 800 metres from Saussignac village in South West France. On the south side we have a great view of Château de Saussignac, a magnificent castle in the centre of the village. 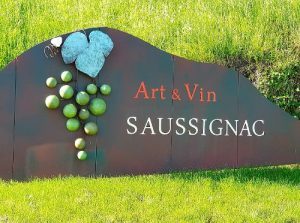 Saussignac is a thriving village in process of transforming into an organic enclave and a village of ‘art et vin’ (art and wine). 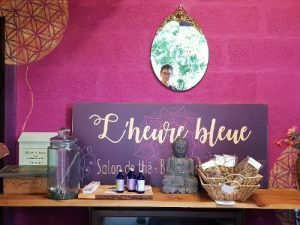 There are many new things to discover including a fantastic café and art gallery – the 1500 run by Mike Rumsby and Lee McNeal, in the centre of the village and a tea house L’Heure Bleue at an organic and ecological centre ‘Ecolieu Cablanc’ 2kms from the village. You can also now rent a part of Saussignac castle thanks to Andrea Bradley ( A French View), a Kiwi with a life-long dream to move to France. In 2016 she quit corporate life and bought a part of Saussignac castle from Bordeaux native Chrystelle Baran and partner kiwi Nick Ferneyhough antique dealers in Auckland. The Château de Saussignac was built by Pierre D’Escodeca de Boisse, the Cavalier de Pardaillon, an important man in the area under the rule of King Louis XIII. The 1600’s were a time of great conflict between Catholics and Protestants and to keep his prestigious position, de Boisse converted to Catholicism. The Protestants weren’t happy with his conversion and de Boisse was murdered by a gang (allegedly including his own son) in the village of Gensac 25 miles from his home in 1621. Work on the château stopped and it was another century before it was taken up again. de Boisse’s original plan included four towers but was never completed hence from Chateau Feely, the side view of Saussignac Castle looks a little out of balance whereas the front and back views are perfectly proportioned. 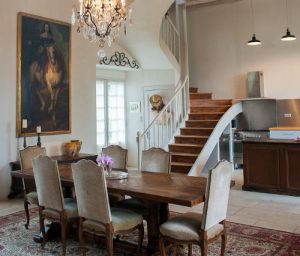 In the mid 1800’s, the château was divided into 5 large apartments, with the left wing becoming the Salle de Fête (our commune’s party hall available for events and community activities). Owners of the apartments now include French families (our friends Pierre and Laurence who you meet in Caro’s books) and expats including Kiwi Andrea, Americans Mike Snow and Timothy White who offer art and photography courses and an English family. If you are tempted by Chateau Life you can now also buy a piece of Saussignac Castle as Mike and Tim have just put their tower up for sale – Tower of Chateau de Saussignac photos and details. 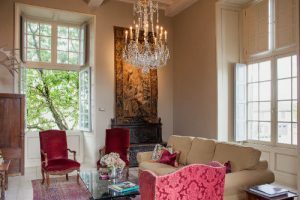 Andrea’s beautiful section of Saussignac Castle is available as a luxury holiday rental and she has developed two boutique tours for lovers of fine wine and food and châteaux and gardens that include wine and food and wine experiences hosted at Château Feely. For more info about renting the castle or doing a luxury tour in May 2019, visit Andrea’s website A French View. Thanks to Andrea for the info and super photos provided for this post. Read about the story of Feely organic vineyard and about the village of Saussignac in Caro’s series of three books Grape Expectations; Saving our Skins and Glass Half Full . You can join the mailing list to receive a seasonal newsletter, events, wine pairing, recipes and more info on this topic at the bottom right of this page. 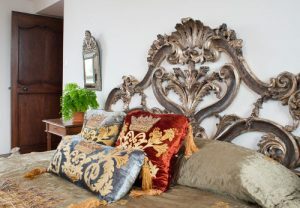 It is also possible to stay at Chateau Feely or do a multi day course or multi day tour all year round. Hello I am looking for a lovely place to stay for 2 nights for my husbands birthday in April. 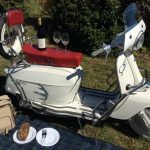 Could you please recommend somewhere in Saussignac . I have seen the site on Cafe 1500 run by Michael Frumsby which looks delightful. A great place for dinner. 3 friends of ours did a painting course with Michael last year, and told us how beautiful it is there. Thank you so much I look forward to hearing from you.